Hello, friends of Hazelnutt House! I was looking through my wardrobe and chiding myself for buying unnecessary clothing items that I end up not wearing. I came across this owl sleeveless top that I adore... the owl looks bright and cheery but I just haven't gotten down to wearing it. 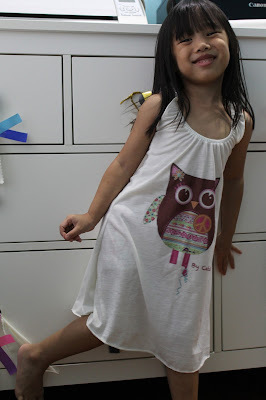 So I decided to do some snipperty snip and convert it into a dress for The Kiddo. This is not an accurate tutorial coz most of the time I eyeballed the material and just snipped. No exact measurements taken. Step 1: Slim the sides by about 1.5 inches. Step 2: Sew along the line and snip with a pinking shears - no need to seal the hem this way. Instead of taking in the shoulder straps and resulting in a tight armhole, I decided to add elastic to the neckline. Step 3: Sew elastic band along the neckline on the 'inner' side. Make sure to tug the elastic as you are sewing. Here's how it looks after the elastic is sewn in. I do not like this finish coz the ruffles tend to flip downwards, revealing the elastic band. So, I added this step. Step 4: Fold in the material, using the elastic band as a guide and sew. When the side is folded in along the elastic band, it looks like a seam is formed. Yups.. this is the end result of the neckline.